On Yukon Gear & Axle Wednesday, Rock Pintavalle used his all-Mopar Duster to take home the $15,000 prize and placed a bullseye on his car as the Bounty on Racepak Thursday. Unfortunately, Pintavalle’s last win light was on Wednesday night as Chad Axford defeated Pintavalle in the very first round today to earn himself the Bounty Award of an Altronics Weather Station. Despite having to make a trip to the Buyback Divas window, we doubt you could knock the smile off Pintavalle’s face with a body grinder. Today was also the Hoosier Tires Door Car Shootout set to take place later in the day. With a number of new entries showing up today, each were the only ones given a time trial before eliminations began. Survivors of round six advancing into round seven were Brendan Jarrell, Jared Pennington, Cameron Manuel, Turtle Brannon, David Georg, Jamie Holston, Jeff Burns, Michael Shoop and Jeff Serra. Winners from that round included, Jarrell, Burns, Serra, Holston and Brannon taking the odd car bye run to advance. Quarterfinals and Burns took out Brannon, while Holston turned on the red-light to advance Jarrell in his truck, and Serra advanced on the bye run, making it two doors against the lonely dragster. In the semifinals, the lonely dragster received the bye run to advance to the final while the two door cars battled it out to see who would face Burns in the final. Serra used a .003 package to turn back Jarrell and take his shot against the fast dragster of Burns. In the final though, it was Burns with the reaction time advantage which he carried all the way through for the $20,000 win. Still left to complete was the Hoosier Tires Door Car Shootout. In the semifinals, the combatants were Garrett Griffith, Ronnie Horwath, Tracey Guffey and Bennie Ulmer. By the time the final rolled around, it was Guffey against 16-year old Griffith who had the reaction time advantage, but it was Guffey dead-on the dial with a “6” which sealed the deal for him. The ante goes way up on ATI Performance Products Friday with $50,000 going to the winner, but before eliminations begins, a big announcement is scheduled to take place regarding the tenth anniversary Fall Fling in Bristol. As they have all week thanks to JEGS and Mickey Thompson Tires, MotorManiaTV.com will be broadcasting the announcement live as it happens, which will surely be groundbreaking in the sport of high dollar bracket racing. 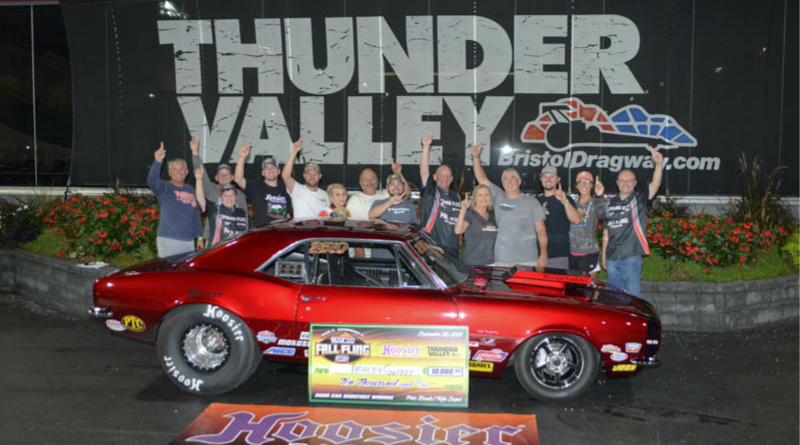 Visit DragChamp daily for the latest in big money bracket racing news online. DragChamp is the source for bracket racing results.